Marie Antoinette once exclaimed, "Let them eat cake!" The cake she was referring to was a large flat piece of bread dough used by bakers in the 1700s. Rolled thick and cooked until it was black and hard as stone, Marie's cake was used as a base and placed over hot coals to protect loaves of bread as they baked. Fortunately, today we do not look at or bake cake in the same way. Why, then, when I go to a wedding and taste the cake, does my mind wander to Marie Antoinette? More than likely because the wedding cake is often dry, crumbly, tasteless and, not made by me. This is my pursuit and my goal: to educate people about cakes and raise their expectations. Cake does not have to be dry and flavorless, it should be moist, cool, delicious and provide a lasting memory of sensual taste sensations. Here in Texas one of our old time favorites is German Chocolate cake. It is really not German at all; it is named after Sam German, who invented the type of chocolate used in this wonderful cake. 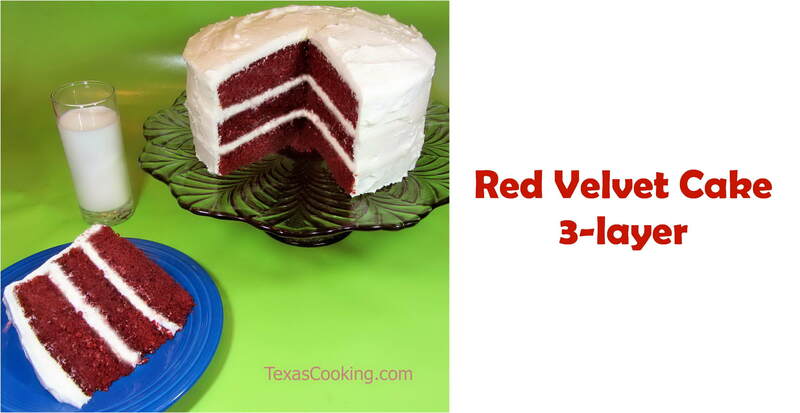 This cake was first popular in Texas and Oklahoma in the 1920s, and the recipe for it was first published in Dallas in 1957. Prepare frosting first by putting butter, sugar and milk in a large saucepan. Bring to boil. Put egg yolks in a bowl and temper in egg yolks by gradually adding small amount of the hot mixture into the yolks. Add yolk mixture back into saucepan and continue to cook until bubbly. Add vanilla and coconut, stir and set aside. To prepare the cake, first prepare the mashed potatoes and set aside. Mix sugar and butter together. Add eggs, one at a time, and add the vanilla. Melt the chocolate in the boiling water and add to mixture. Scrape the sides of bowl. Add the dry ingredients alternately with the buttermilk. Stir in the mashed potatoes. Bake in two prepared pans at 350 degrees for 30 to 35 minutes. After cakes are done, cool completely. I like to put cakes in freezer for at least an hour before I put frosting on them. It works much better. Place one cake layer on a cake plate and spread frosting on it. Place the second layer of cake over the first, and spread frosting over the entire cake. Return the cake to the freezer at any time to firm it up again and make it easier to work with. Actually, this technique works with almost any cake. When the frosting is spread completely and smoothly over the entire cake, place pecan halves around the edge of cake and press coconut flakes around the sides. Try toasting the coconut first for a special taste. My next favorite cake, and one I make often for brides, is an Italian Cream Cake, with a little twist. Whip the egg whites in bowl to stiff peaks, adding half (1-1/4 cups) of the sugar. Set aside. Cream together the butter and the other half of the sugar. Add the vanilla and coconut extract. Add the eggs, one at a time, and then add the dry ingredients (flour, baking powder, salt and baking soda), alternating with the wet ingredients (buttermilk and amaretto). Add the coconut and pecans. Beat well. Fold in the beaten egg whites. Pour into two prepared pans and bake at 350 degrees for 30 to 35 minutes. For cream cheese frosting, the ingredients should be half way between cold and room temperature. Cream together 1 pound of butter with 1 pound of confectioners' sugar. Add 6 3-ounce packages of cream cheese and 3 teaspoons of lemon extract. Preheat your oven to 325 degrees. Prepare a 10-inch bundt pan. Spread chopped nuts evenly over the bottom of the pan. Mix the cake mix with all the remaining ingredients until smooth, and pour the batter into the pan. Bake for 1 hour, cool in the pan for 25 minutes, then invert the cake onto a serving plate. Spoon and brush with rum glaze. To make the rum glaze, heat 1 stick of butter, 1/4 cup water, 1 cup sugar, and 1/2 cup rum in a saucepan. And no, the recipe was never sold by Neiman Marcus for an unreasonable sum to an unsuspecting patron - old urban legend. Cream the Crisco and sugar together. Add the eggs, one at a time. Then add the vanilla and salt. Add the dry ingredients alternating with wet, scraping the bowl often while mixing. Pour into prepared pans and bake at 350 degrees for 30 to 35 minutes. Combine the flour, sugar and milk and cook until thick. Add the vanilla and butter, and cook until fluffy. Cool, and spread on the cake. This next one is a favorite of my family, and they ask me to make it often. It begins as a yellow cake. Cream the butter and sugar together. Add the eggs, vanilla, salt. Then add the dry ingredients alternately with the milk. I then add the partially defrosted, frozen strawberries. Bake at 350 degrees for 30 to 35 minutes in two prepared pans. This can also be used in muffin tins for delicious muffins. Cool cakes. In a mixing bowl, whip 1 pint of whipping cream and add 3 tablespoons confectioners' sugar. This is called Chantilly cream. Spread on the cake and decorate as you wish. This last one is for the chocolate lovers out there like me. There are so many chocolate cakes to chose from, it is hard to just pick one, but this is a good starter. Add the chocolate to the hot water and set aside. Cream together the butter and sugars. Add the eggs, oil, salt, chocolate/water mixture and vanilla. Add the remaining ingredients, alternating wet with dry. Bake at 350 degrees for 35 to 40 minutes. After the cakes are cool, put them in the freezer until ready to decorate. The best is yet to come. Put 5 pounds (that's right, 5 pounds) of chocolate chips in your mixer. Add 1-1/2 cups of boiling cream, and mix slowly until the chocolate is completely melted. Add 2 teaspoons vanilla, 4 tablespoons of light corn syrup, and 1/2 stick of butter. Take half of the mixture and spread onto a sheet pan. Let it cool in the refrigerator. When completely cooled, put it back into the mixer and whip at high speed until it reaches a spreadable consistency. Put one layer of the chocolate cake on a cake plate and spread the whipped ganache on the layer. Place the second layer over this one and spread ganache over the entire cake, making it as smooth as possible. Return the cake to the refrigerator for at least 1 hour. Melt all the remaining ganache in saucepan. When the cake is sufficiently cool, pour the melted ganache over the entire cake, quickly and evenly. Gently shake the cake until the excess chocolate runs off. Return the cake to the refrigerator until serving time. Decorate with fresh raspberries or whatever you desire. This cake can be wonderful and it should be, especially when so many of our special life-transforming events include it and surround it. Enjoy a new look at cake!